What do Madrileños do on a Friday night? Eat, drink and definitely not sleep! Maria, my expat friend and tour-guide for the night, showed us how the locals do it. I think the key is to stop frequently for sustenance. One of the many highlights was a little "cave" called Mesón del Champiñón (House of the Mushroom), one of the oldest taverns in the city and located under the Plaza Mayor. As the name would indicate, they serve mushrooms — stuffed and grilled to perfection — and that's about it. It's a narrow room with walls decorated in a funky green and brown pattern with with a bar on one side and a small back room with an organ player where the locals come to dance off all the calories they consume here. A small portion of the bar serves up pitchers of sangria and cervezas while the lion share of the space is dedicated to cooking the house specialty. 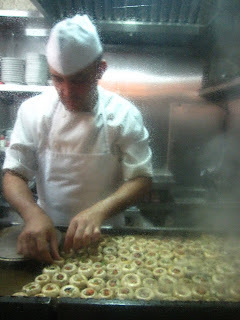 There are trays stacked ten high with stuffed mushrooms waiting to be cooked as the orders fly in. I was grateful for the plexi-glass wall in front of the grill so I could watch the chef in action. It's quite a process to behold. At full tilt, he had more than 200 mushrooms going at once. We ordered a ración, which was delivered hot off the grill and served with lots of toothpicks. I don't know if the toothpicks are supposed to keep people from nibbling off your plate or what, but it's a highly plausible theory once you taste them. Each one is filled with bits of chorizo, garlic, and herbs with a healthy dose of salt and oil. Low fat: No. Delicious: Yes. It was just the hearty snack needed to energize us as we set off into the night once again to mingle among the locals and visitors alike who enjoy the city's thousands of bars before heading to a disco at sunrise. Seriously, I now know why there is a siesta each afternoon.